The white #24 a.k.a. "The Lone Merc"
Harry Jones started racing in 1953 and retired in 1965, due to a shop accident in which he lost the sight out of his left eye. Harry lost his battle to cancer in may of 1998, after a nine year battle with the disease. Some of the Michigan tracks he raced at were Hastings, Galesburg, Spartan (Lansing), Kalamazoo, Jackson, Speedrome (grand rapids), Flat Rock, Dixie Speedway (Flint), and Motor City (Detroit). 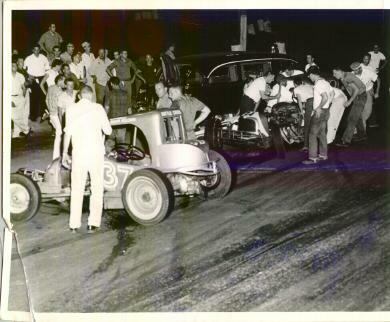 In Indiana he raced at south Anthony Speedway (Fort Wayne). 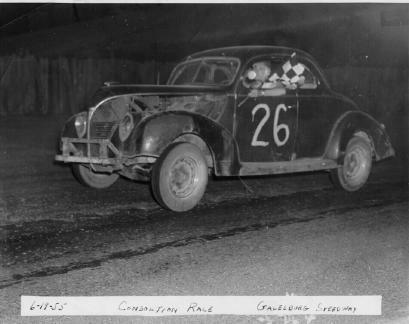 In Ohio, Harry raced at Toledo Speedway, Lorain County (Elyria), and Sandusky. He also traveled to New York and raced at Oswego, Spencer (Williamson), and Shangri-la. The Canada tracks were Milestown (London), Delaware (London), and Flamboro (Toronto). He won over one hundred features with Galesburg being his favorite. 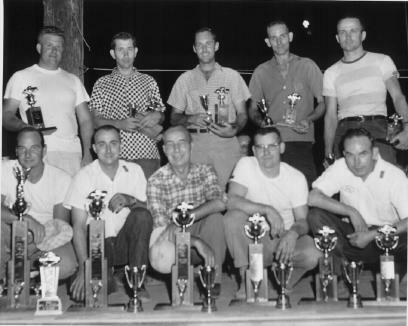 There, he won the points championship in 1961 and 1962 and also won the points championship at Dixie in 1963. 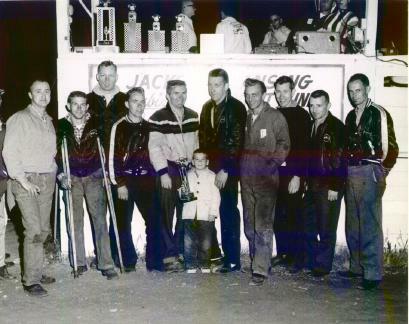 His most memorable race was at the Milestown track when his car was disabled so for the first time he sat in Max Dowker's (#7) car and won fast time and the 100 lap feature. Junior Newberry and Bert Cuyler were each at one time co-owners with Harry. It is our hope, as Harry's family, that people will find pleasure looking at the pictures and maybe even a memory will be sparked for somebody involving a time they saw the "Lone Merc" race.